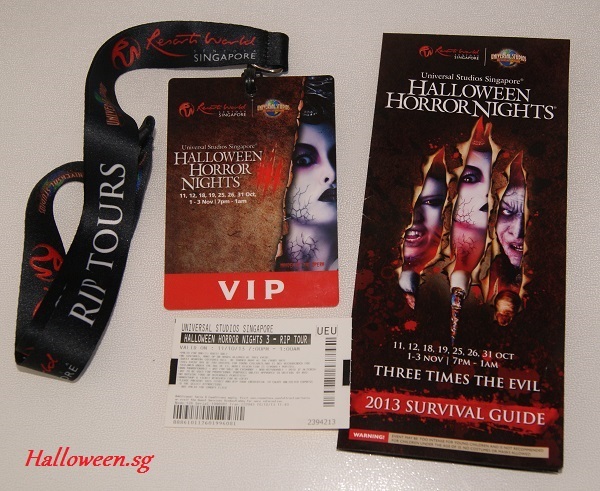 On the first night of USS Halloween Horror Nights 3, 11th Oct 2013 (Friday), with my fearless friend, we joined the 7.30pm RIP Tour. I won’t be covering too much of the haunted houses and scare zones. 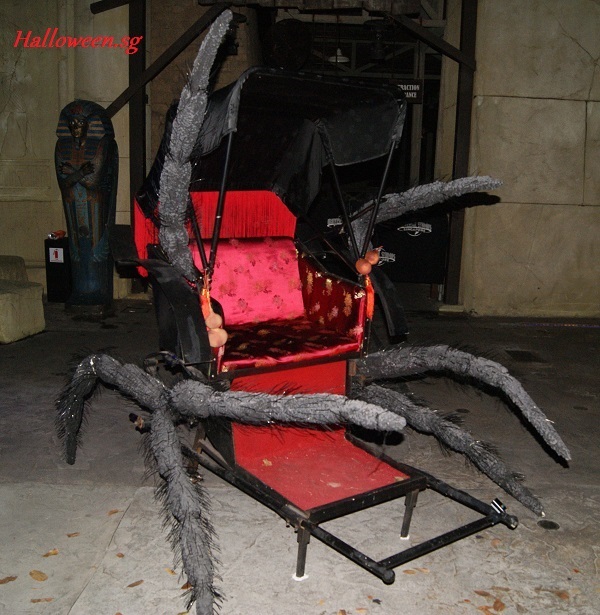 I will just share my personal experience for the HHN3 RIP Tour. 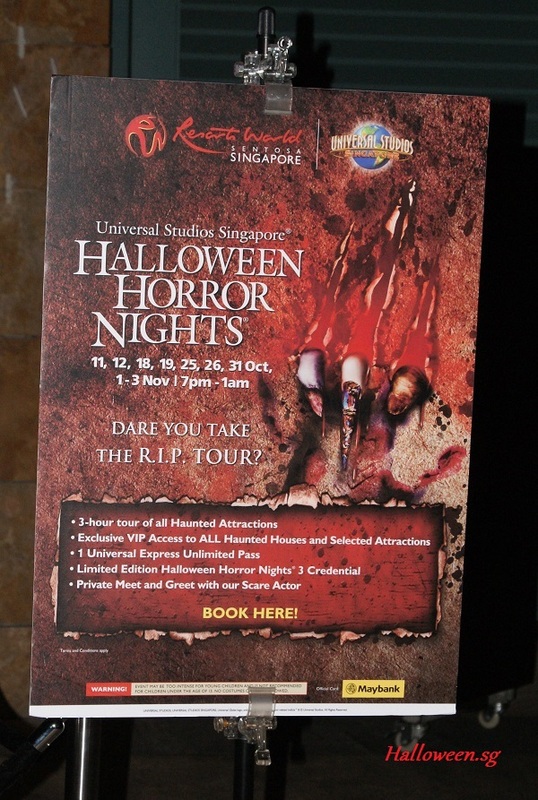 – ONE (1) Halloween Horror Nights 3 ticket pass. – ONE (1) Universal Express Unlimited pass. – ONE (1) RIP tour credential, lanyard and glow stick. 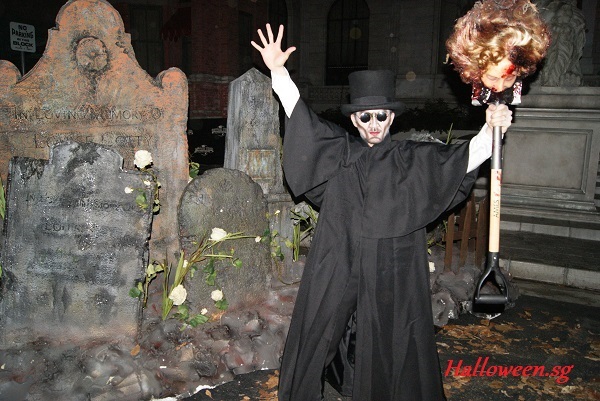 – VIP access to all haunted houses, scare zones and selected rides. – Complimentary refreshments at the VIP reception. – ONE (1) $10 meal voucher for use at any F&B carts/outlets in USS. – Opportunity for a private meet and greet and photo session with the characters. – 10% discount on selected merchandise at USS retail outlets. – 10% discount off total bill at USS F&B outlets (Not applicable for alcohol and souvenir items). – Fujifilm one-for-one promotion for photo prints. We reached USS area at around 6.45pm. There were people paying for face painting by professionals ($10 for quarter-face, $20 for half-face), people taking photos, people buying “blood” drinks from the blood angels who were pushing their grisly goods around boldly, and a mass crowd waiting at the gate eager to rush in to experience the horrific scares. At 7.00pm, we went to the VIP reception. As there is a 7.00pm RIP Tour group in the lounge, we came back at around 7.20pm and we were invited into the VIP lounge to wait for the tour to start. Each tour group departs every half an hour starting from 7pm. 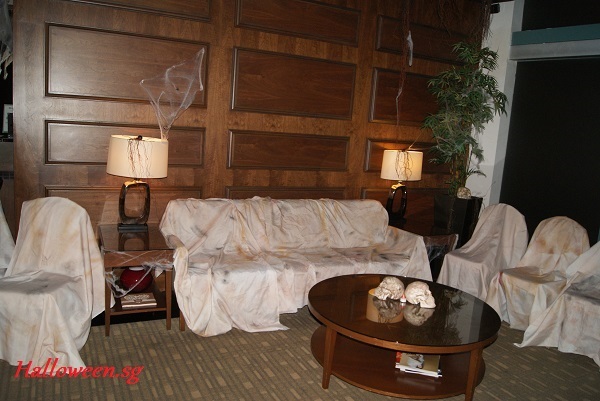 We missed the opening scaremony of the 3 evil sisters (teleportation trick) as we were in the VIP lounge which was outside of USS. 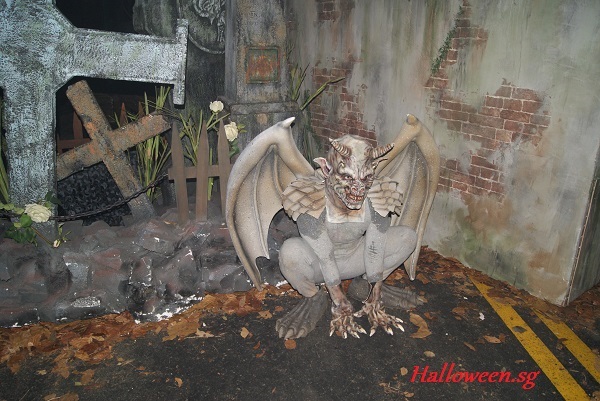 You can check out the HHN3 Opening Scaremony youtube video recorded by one of the visitors. While waiting for the rest of our tour mates, a pale looking blood stained staff served us our complimentary drink. Both of us chose cranberry juice. The time has come, all our tour mates arrived. Our group had a total of 6 people. Our personal pretty zombie guide distributed each of us a VIP pass with lanyard and a glow stick. Only VIP will have a glow stick. Our zombie guide briefed us the instructions of the RIP tour, safety aspects and navigation around USS. This personal guided RIP tour will last for about 3 hours. 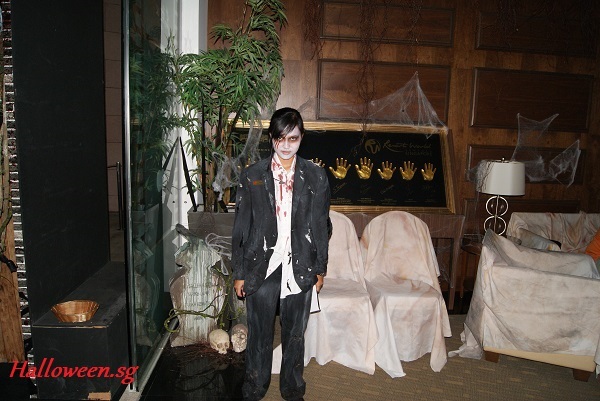 We were told that the scare actors will never touch us and pleaded to us not to attack their wandering ghostly staffs. In less than 2 hours, we completed all 3 haunted houses (Adrift, Songs of Death, Possessions) and the 3 scare zones (Attack of the Vampires, Convention of Curses, Possessions). Before each of the haunted house and scare zone, our guide explained to us the background story of each and attempted to spook us with a creepy voice. 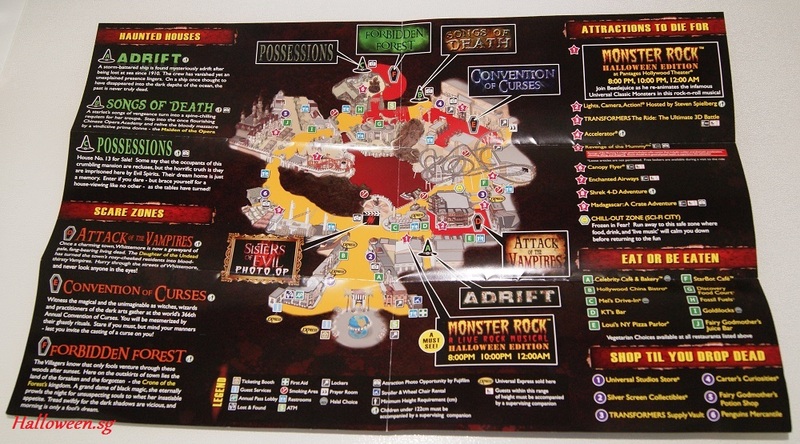 For the last 1 hour, we took some of the exciting rides like Revenge of the Mummy, Transformers 3D Battle, Enchanted Airways, Canopy Flyer and ended with Monster Rock Halloween Edition at 10pm. 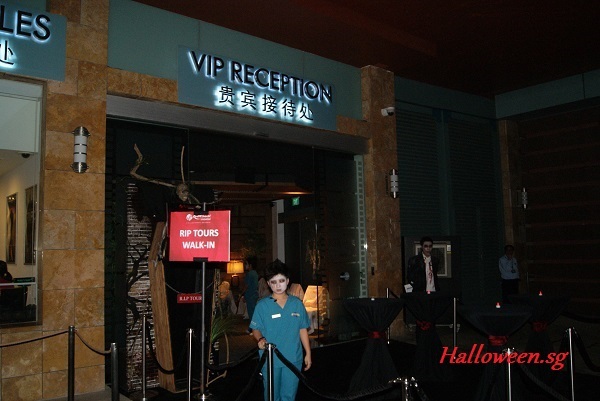 At each haunted house, there is a special route for the VIP to an exclusive VIP entrance of the haunted house. We do not need to queue unless another RIP group is there, which is rare. Waiting time is usually 0 minute while the average waiting time for the normal queue is about 60 minutes and express queue about 15 minutes. For other normal rides, such as Transformers 3D, Revenge of the Mummy, our guide leaded us in from the ride’s exit direct to the front of the queue. 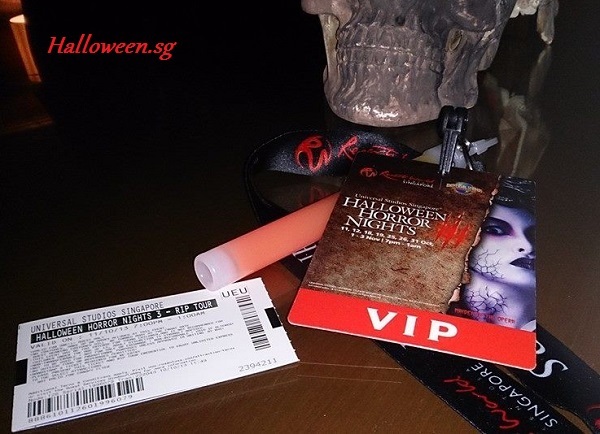 At the haunted attractions, whenever you walked past the frustratingly long normal queue and cut to the front of the express queue (which was still quite long), the feeling of having VIP access was indescribable. 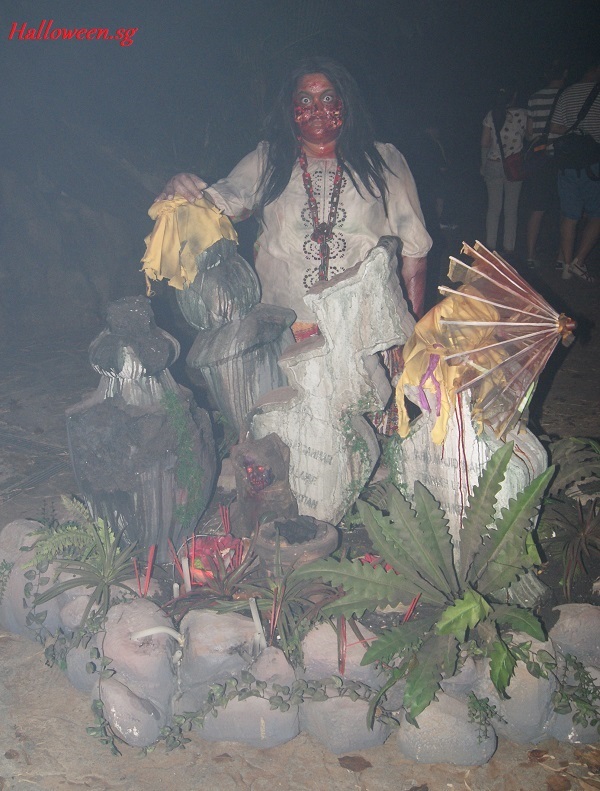 At any point of time during the 3 hours RIP tour, if you want to take any rides or go for another haunted house again, let the guide know and they will bring you in again. 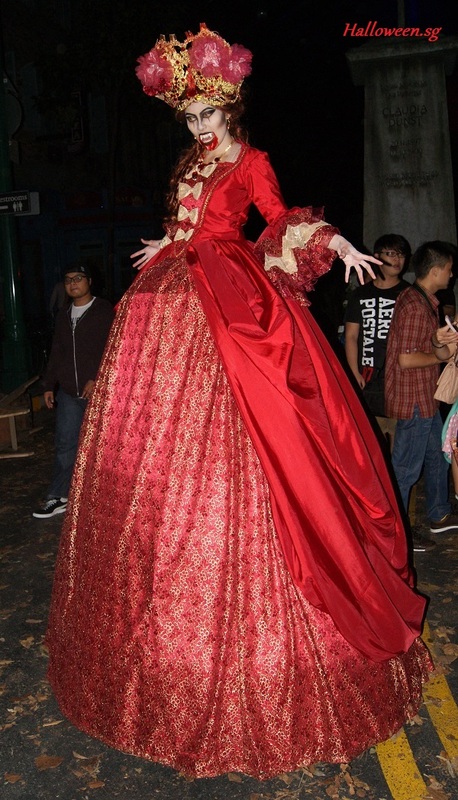 You will have unlimited VIP access to any rides and haunted houses during the guided tour. Normal Express Pass has only one time per attraction priority access to the 3 haunted houses and all USS attractions. After the 3-hour RIP tour, the RIP VIP pass becomes an unlimited express pass to all the attractions (except Canopy Flyer). Our 3-hour tour ended, our personal guide left. Me and my fearless friend decided to go for the Mummy’s ride since it’s the next most exciting ride after Battle Galactica (which was not in operation). We flashed our VIP pass and tried to enter the express queue but the gatekeeper denied our entry. She said our “express” pass can only enter attraction once and asked us to go join the normal queue. We emphasized that this was a RIP Tour VIP pass which is an unlimited express pass. Another gatekeeper came, said the same thing and both of them refused our entry to the express queue. We were heated, walked all the way back to the guest services at the entrance and clarified the issue. The customer service guy quickly double checked the entitlement with their higher level management and confirmed the RIP VIP pass is indeed an unlimited express pass. He apologized to us and comm to all ride station managers and make sure all gatekeepers get the message. Wasted 30 minutes of our horrifying time to the guest services and back to the Mummy’s ride entrance, the gatekeeper immediately allowed us to join the express queue. 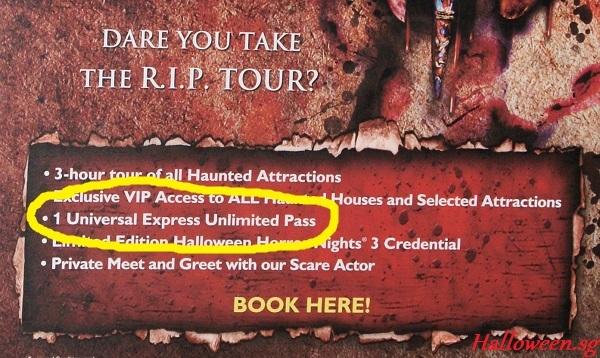 For those who are joining the HHN3 RIP Tour for the next 9 days, after we “waked up their idea”, you will not suffer embarrassing moments like us being denied express queue entry with a supposedly distinguished VIP pass. Like the other attractions, we had priority photo taking session with the 3 sisters at the main stage. 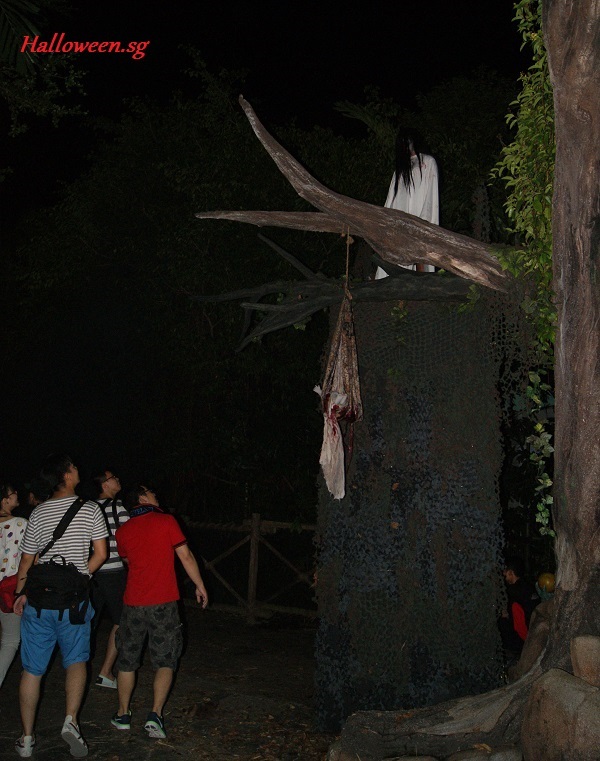 At the scare zones and anywhere, if you want to take any photos with any spooky characters, just inform your guide and they will bring them to greet you. If your picture is taken by USS, you can get the photo prints at one-for-one promotion. At around 12.30am, feeling hungry, realized we still have our $10 meal voucher, we went to the Mel’s Drive-In for supper. 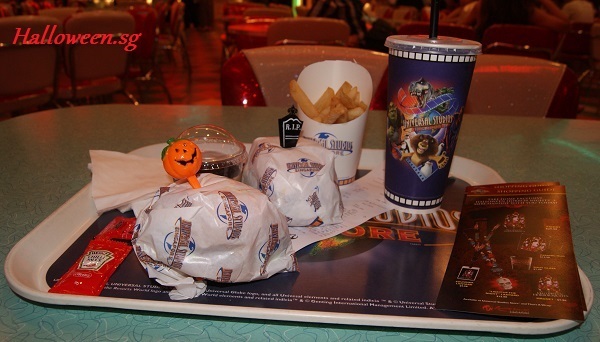 I ordered the special Halloween combo (Chicken Tikka Burger, Fries, Soft drink and a Dessert – $15.80). After 10% and $10 off, I paid less than $5 for the meal. 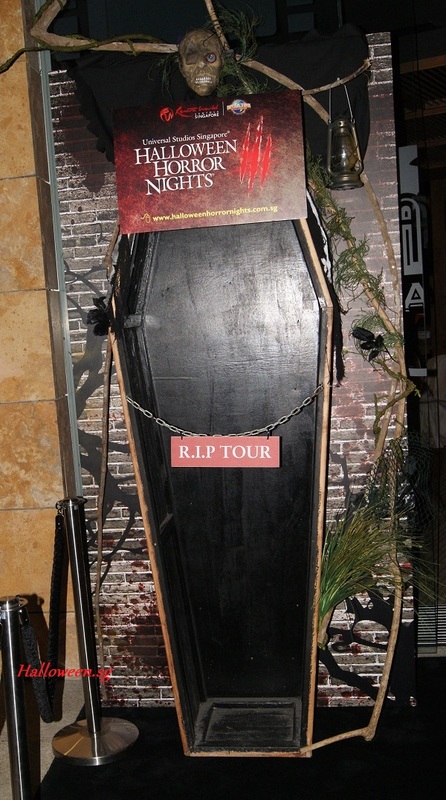 If you have some money to spend and really hate queuing, HHN RIP Tour is for you. 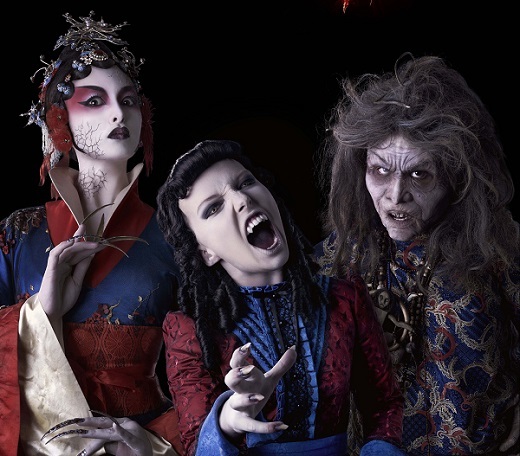 You will enjoy the most out of Halloween Horror Nights with the VIP access privilege. Happily going from haunted house to haunted house, rides to rides with virtually zero waiting time to get into action. You get to take pictures with all the spooky characters without the need to fight for their attention. They will come and greet you upon request. 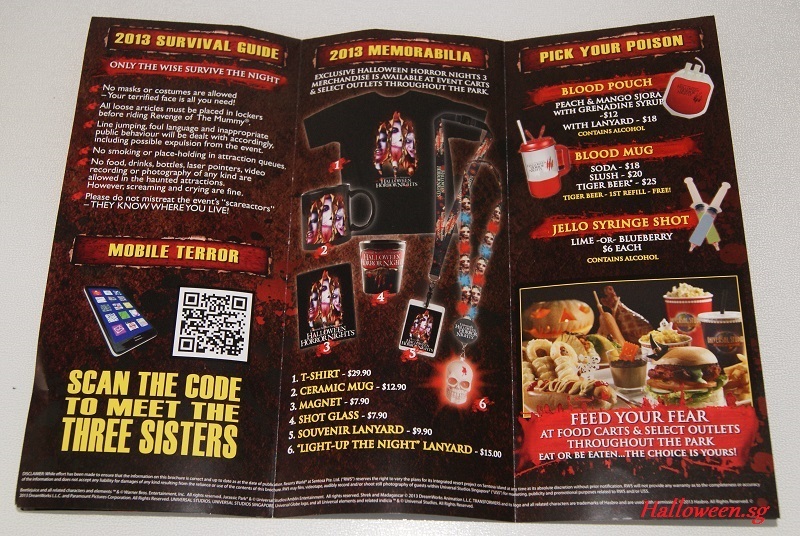 If you want to enjoy HHN without spending almost S$200, you MUST get the express pass. Although Halloween.sg team was not invited to HHN3 media preview, the other 2 of the biggest Halloween events in Singapore, both Sentosa Spooktacular and Museum of Horrors invited us to their media preview. Stay tune with us!